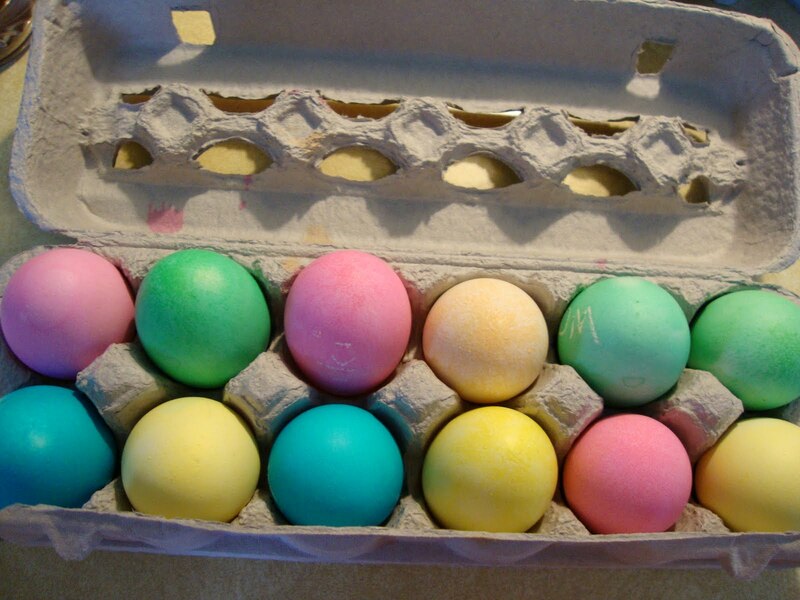 Have a dozen white raw eggs colored beforehand (kid-friendly!). Set aside. We use a white wax crayon to write names on each person’s egg. Procedure: Mix all the dry ingredients in a bowl. Make a well in the middle and add the milk, eggs, vanilla, and butter (make sure to add the butter last). Mix with your hands and form a ball. Cover this with a bowl or something similar and let rest about 5 minutes. Knead for 5 minutes. Form some of the dough into basket shape (flat-ish oval). Take 2 long strips and twist into handles. 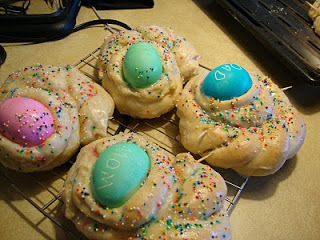 Press one raw colored egg into the center of the basket and secure it with one strip of dough. Secure handles with wooden toothpicks. Bake at 350 degrees for 1/2 hour. Bake on cookie sheets covered in foil. This recipe makes 10 to 12 baskets. The recipe may be cut in half if desired. As soon as they are out of the oven, glaze with powdered sugar mixed with a little water (although I’ve used milk too) and a drop of vanilla extract (sometimes I skip the vanilla). Add water a few drops at a time as not much is needed. Add more powered sugar if it’s too runny. Make the glaze while cooking the baskets so it will be ready to use as soon as baskets are out of oven. Sprinke with nonpareils or other. Set aside to cool on racks.